We are always hearing about the prospects of the IT sector in Bangladesh and how computer programmers in our country can compete with the best in the world. We have also seen, from time to time, evidence of this idea, in the programming contests organized by ACM. However, the pure software development wing of the sector does leave something to be desired. Recently though, we have had one good piece of news coming our way concerning the aspects of software development and pure academic research. A.B.M Abdullah Proshno, a Sophomore student of Computer Science and Engineering in BRAC University, has had a research paper accepted in the IEEE conference to be held in China in January 2004. He is the youngest Bangladeshi to have a research paper accepted for such a conference. Not so long ago, this reporter got an audience with the prodigy, and asked questions and obtained information that maybe interesting to people who would like to know more about this young man who has done something quite unexpected in the context of Bangladesh. Interest in computers is something that came to Proshno long before he started his undergraduate program in the subject. His elder brother, Onko, is one of the well-known programmers of the country and among the pioneers of the use and development of Bengali in computing. Onko, along with his friends, worked on Bengali fonts and word processors. Watching his elder brother working with computers inspired Proshno, and he developed an interest in the same field as his brother the use of Bengali in computing. Proshno did some work in the field even when he was in the last year of school, developing a Bengali encyclopedia called "Bishwakosh". After joining BRAC University, he worked more on his programming. During his C++ course, all the students had to turn in a project of their own. Keeping his interest and background experience in mind, his Advisor Ashfaq Rahman suggested him to develop a Bengali spell checker. Along with a lot of programming, Proshno also had to do extensive research on the Bengali grammar, syntax and alphabets. Even then, it was simply a project for the term final and concentrated more on his use of the C++ language rather than any of the higher stuff that he later had to go into. Little could anyone have guessed how this project will end up in a research paper submitted to IEEE. Earlier this year, the North South University Computer Club organized a software fair, in which the Bengali spell checker developed by Proshno won the 3rd prize. It was after this experience that Proshno started giving serious thought to the idea of putting in some more work and developing his project into a complete, professional level spell checker that would be compatible with Microsoft Word, the leading word processor of our times. Keeping this goal in mind, Proshno started research on various algorithms that use the phonetics of a word to look for its substitutes. This means that when a word is not found in the dictionary, such algorithms look for the word that is closest in pronunciation, rather than closest in alphabetical order. Using such algorithms is generally more efficient, since they usually provide better suggestion words as substitutes. There are many such algorithms, but all of them are meant for use with the English alphabet. Thus, Proshno had to do some more work on how one of these algorithms could be used with the Bengali alphabet. After extensive research, he came up with modifications that allowed implementation of the algorithm to the Bengali language. At this point, Ashfaq Rahman, a lecturer in BRAC University, and his advisor on the C++ project that started it all, suggested that he write out a paper featuring all his finds, modifications and difficulties while developing the spell checker. Proshno started on the paper, more out of a will to explain all that he had learned rather than with publication in mind. After he was done with the paper, Mr. Ashfaq Rahman read the paper and suggested some modifications. After the necessary changes were made, the paper was sent to China, California and India. Just about two weeks ago, he received a reply from China saying that his paper has been accepted and will be presented in the IEEE conference to be held in January 2004. He is yet to receive a reply from India and California, but hopefully they will be positive too. At the moment, the Bengali spell checker uses developed algorithms to compare words based on their pronunciations and is perfectly compatible with Microsoft Word. Proshno has ideas for the further development, one of which deals with cases where multiple suggestions are offered. Under such a circumstance, the most suitable word has to be found out by sorting or maybe even all the suggested words have to be listen in order of decreasing priority. Developing a spell checker for a language like Bengali is no mean feat in itself. Add to the fact that Proshno did extensive research on algorithms, came up with some modifications and ended up being the youngest Bangladeshi to come up with a publication in an international conference and you can realize what a point of pride this is for our country. This probably proves the fact that we do have a bright future in this field. All that is needed is adequate backing and encouragement, and maybe some day we will have a greater frequency of undergraduate students doing research on highly technical subjects and come up with papers of their own. I warn you--this is going to be tasteless. But I gotta share this tale because its too bizarre. My friend Churum Churumwho was told this tale by his old forgetful father, passed this tale to me. Churum Churum and his 14 generations hail from Brazil. I mean, Barisal. Those who have not been to Barisal should know that it's a land full of waters, shoal, amra, funny accent Bangla, rice, crocodiles and eating jack-fruits and mangos by tons. My tale is about a man who encountered a danger, and hardly got away saving his a**. That's right. A**! Mona Mia had his breakfast with two kilos of rice, a pinch of salt, an onion and six chilies. He was on his way to the paddy field when he had his stomach rolling. At first he stopped and told himself that he should not have had those two jack fruits last night. The rolling stopped, so he resumed walking to the field. The rolling resumed again. This time, Mona Mia simply dropped his farming tools, pulled up his lungi and started running to the river. The village where he lives is located right beside a river (one of many in the Barisal region and I can't recall the name. But that's no point to discourage you in believing the story). It was early monsoon. The rivers are swelling with water and bustling with fishes. It is also ideal for leaving your excreta without polluting the waterbecause the strong currents sweep things just in seconds. Mona knew a perfect spot to respond to this call of nature. There was this old uprooted tree by the river bank. Its low and the top of the tree fell in the watera perfect natural toilet for Mona and his likes. Mona got up the trunk and sat at a convenient point keeping his two legs on two dead branches. Mona was in seventh heaven of ease. Nothing like a good ol' potty (language truncated to suit minor readers)! Meanwhile down the river, the stomach of a crock was churning due to an altogether a different reason. It was hungry. The old crock did not have its catch for perhaps a week or so. Otherwise it would not have had hallucinated like this. 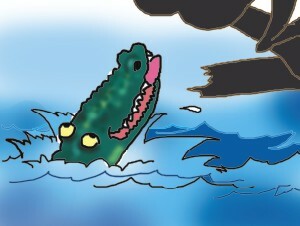 The crock was alerted by plopping sounds in the water. It swam to the source of the sound and came near the tree trunk. It saw some things falling in the water from above. The old crock proceeded with predatory caution and as it looked out of the water it saw… well, it saw… Mona's bottom. The crock struck like lightningits pointed mouth grabbed the meat as if to say, "eureka! Eureka! Got my breakfast!" "Uriii maaa!" screamed Mona and he pulled himself up gathering his full strength. The old crock and he struggled for a few seconds and Mona sprang up. This sudden jolt had displaced the old crockstill trying to hold the piece of a** with its mouth. This time, instead of meat, its tooth hits the tree trunk and got stuck there. A screaming Mona broke a dead branch of the tree and started hitting back the crock. The crock struggled and crack. Some of the crock's teeth broke and remained stuck in the tree trunk. Bleeding, the crock left the scene. Bleeding, Mona left the scene. Later villagers gathered at Mona's house as he became ill with fever. Bandages covered his bottom. The seniors came and solemnly vouched to kill the crock. However when they got out of his room, Mona swore to himself that the men were giggling away. Mona died several years laterlamenting that a crock his tarnished his image. I am sure the crock also died few years laterlamenting that he could not even properly bite an a**.